Honestly, nobody really needs an introduction to Nepal. Nepal is famous for, well the highest mountain in the world obviously, Mount Everest, also known as Sagarmāthā in Nepali or Chomolungma in Tibetan. However, that is not the main reason why many backpackers and hikers are drawn to Nepal. It is host to the Himalayan range of mountains which contains 8 of the world’s 10 highest peaks. This leads to endless beautiful circuit treks with jaw-dropping scenery and 8000m+ snow mountains every step of the way. Supposedly, one such circuit is the Manaslu Circuit Trek. There are many treks in Nepal with various difficulties. The most famous and accessible ones are those with acronyms, such as Annapurna Base Camp (ABC), Everest Base Camp (EBC) treks, or their respective circuit treks. If you say you are going Nepal, most people will ask “ABC or EBC?” I don’t blame them, but I can’t help but get slightly annoyed by the assumption that those were the only treks in Nepal. With the development of roads into the Annapurna region and the increasing influx of tourists, many hikers are looking now looking at other alternatives to in Nepal. One such trek gaining popularity and recognition over the years is the Manaslu Circuit Trek. In fact, the Manaslu Circuit Trek is being touted as the “New Annapurna”, or what Annapurna was like 10 years ago. However, it is still relatively unknown and I can bet if you said you were going to Manaslu in Nepal, everyone is going to go huh? Searching for a place in Nepal to do my yearly long-trek, I decided on the Manaslu Circuit Trek after reading great things online. Being relatively untouched, one can still experience raw adventure and culture while staying in a teahouse. It moves through remote and authentic Hindu and Tibetan villages, dense forests home to different flora and fauna of the Himalaya region, nerve-wrecking suspension bridges along the Buri Gandaki river finished off with a high elevation mountain pass alongside spectacular scenery and classic Himalayan peaks. Some even argue it is the best general trek in the country. Additionally, once you are done with it, you can easily continue onto the Annapurna Circuit Trek. It suited my deposition to visit somewhere not so commercialized, yet comfortable enough because I wasn’t really in the mood for camping all the way. Upon visiting, I realized there are quite a few details nobody really talks about online which I wished I knew beforehand. Therefore, this post seeks to provide critical information to people who are interested in doing the Manaslu Circuit Trek. I also hope this post provides a discerning opinion of the trek and cuts through all the hype that is presented online. Of course, at the end of it, it is only my opinion and corroborated by my experience. Escape the crowd in Manaslu. It is far less crowded than Everest Base Camp or Annapurna Circuit. Although it is getting more popular, there are still about 10 times fewer trekkers on the Manaslu Trail. The estimated number of people on the Manaslu trek in a year is only 2,000, and more than half of it do it in October. Clear view of Himalchuli (7,893 m), Manaslu (8,156 m), Sarangi Himal (7,161 m), Ganesh Himala II (7,118 m) and several other 7000-8000m peaks while trekking. There is also the chance to visit Manaslu Base Camp. The possibility of adding on side trips such as Tsum Valley, Manaslu Base Camp or to the Tibet Border. Also, one can continue on to do further treks in Annapurna. The trek is still reasonably wild and remote, with a chance of seeing indigenous wildlife while staying in local teahouses at every stage. Trekkers do not necessarily need to bring tents and food, making it more accessible and affordable than similar treks. The trailhead can be reached with a vehicle from Kathmandu, avoiding the need for domestic flights. The first part of the trail follows the Buri Gandaki river with many amazing suspension bridge crossings over the gushing sounds of the river and majestic waterfalls all around you. There is a variety of trek scenery. The trek starts with the subtropical jungle at a lower elevation before going through the Himalayan foothills and villages to crossing the high pass of Larkya La above 5,100 meters / 17,000 feet. Treks in Nepal are basically split into teahouse or camping treks. Teahouse treks are basically treks where you have the possibility of staying in lodges. They are generally cheaper than camping treks. Camping as its name stipulates requires one to stay in a tent and bring their own equipment all the way because there are no lodges available. The Manaslu Circuit Trek became a tea-house trek after 2010. There is still a possibility of making it purely a camping trek but most people do it as a tea-house trek. The only time you will really need to camp is if you attempt any of the side treks such as Manaslu Base Camp or stay in Larkya Pass. There are 4 seasons in Nepal like in most countries. Spring (between March – May): Mild warm temperatures at lower levels but colder at higher levels. It also the season for flowers and the time to see the sweeping beauty of national flower of Nepal, the rhododendron in the mountains. Summer (between June – August): Although it is the summer season, it is also the monsoon season. Weather wise is a mixture of extremely hot at low levels, high humidity and thunderstorms, especially in the afternoons. It also means that there will be lush vegetation around. Autumn (between September – November): This is the peak tourist season in Nepal due to the most favorable weather. Most festivals in Nepal also occur during this period. The only downside is dealing with the crowds. Winter (between December – February): At lower elevation, trekking is good due to the cooling weather. The skies are usually clear also with little rain, which means it is perfect for seeing the night skies. However, at higher elevation, the weather can be drastically cold and require proper equipment. It can also be dangerous at certain points. The general rule of thumb to visit Nepal is during the Autumn which is from September to November. Those who wish to avoid the crowd go during Spring (March-May) instead. Most people avoid Winter (Dec-February) as many mountain passes are too cold or too dangerous and the need for specific equipment. Although the Manaslu Circuit Trek can technically be done in any season. However, it is best to avoid the winter season unless you love snow and is especially adventurous. This is because some of the lodges are the higher levels are closed and there will be very little support if you get injured or if anything happens to you. You will also need to bring your own tents and crampons. In Nepal, specific trekking and conservation permits are required when you enter certain areas or districts. There are 12 main districts and 14 area permits altogether. On top of that, there are conservation permits required. This means two things. One, there are additional costs. Two, you will need to find a travel agency to arrange it for you or find out how to apply for it yourself which requires time. The permits have a different cost depending on the season. For ease of explaining this, the peak season refers to September to November, while off-peak refers to December – August. The Manaslu Circuit Trek cuts through 2 districts, the Manaslu District and Annapurna district. Peak season : US$ 70 per week per person and after 7 days US$ 10 per day per person or equivalent convertible foreign currency. Off-peak : From December to August US$ 50 per week per person and after 7 days US$ 7 per day per person or equivalent convertible foreign currency. The checkpoint in is in Jagat and checkpoint out at Dharapani. Check point at Jagat and Dharapani. 35 USD per week per person for peak season. 25 USD per week per person for off-peak periods. This odd permit is needed for other areas of Nepal, but not needed if you are doing the Manaslu Circuit trek even if you end in Dharapani. However, if you are intending to extend your trip and combine it with the Annapurna circuit, you will be required to apply for TIMS. To find out more information on how to obtain the permit, lostwithpurpose has a pretty good post on it. This is extremely important! Permits for Manaslu are unfortunately only issued to groups of 2 people or more. Individual trekkers will not be issued trekking permit. To get around it, some people apply for a “ghost permit” which in some cases requires an actual passport. It also means paying for 2 persons instead of 1. Alternatively, individuals can look for agencies to pair up solo trekkers just for application of the permit. You can go together until Jagat and split after that. It is also not possible by right to ‘DIY’ the trek as you technically need 1 guide/porter with you. The guide can act as a porter and vice verse. The problem can be finding the right guys. Often, there are many instances of having unprofessional guides. If you are adventurous and look to almost DIY it, you can engage a porter and risk him just carrying your items and disappearing along the route, only to appear in the guesthouse at night, most likely half drunk. This also happens if you approach a guide directly. I have met quite a few travelers along the way because the guide simply uses the money to buy Arak (local alcohol) and drink his days away, or disappear along the trek. You will need to obtain a climbing permit if you wish to attempt any of the published trekking peaks in Nepal. They are split into ‘A’ and ‘B’ peaks, I am not sure how or why they categorize them. For more information on the cost, please view http://www.taan.org.np/pages/trekking-peaks-fees or http://www.nepalmountaineering.org/noticespage-13-NMA%20Peaks. There will be a need to get an insurance. The most important thing is to cover for helicopter usage which is your fastest and often only way out if you are injured. Helicopter is almost like a taxi in the mountains. As the Manaslu Circuit is almost the same route as the Manaslu Trail race, the information there suffices. I used Direct Asia because it used to cover 6,000m and Nepal, but now it doesn’t anymore. The most important is that the insurance must cover your activity, the altitude and cover your cost for helipcoter! We tried getting local insurance but it seemed too difficult to process. As the permits require passport photos, make sure to have at least 4 passport photos for the trek. There are many shops in Kathmandu offering passport photo services so it will be fine if you don’t have it beforehand. The standard itinerary for the Manaslu Circuit Trek is around 12-14 days. It can be adjusted to include side trips which extends the number of days, or by taking a helicopter which can reduce the total number of days. However after I had done the trip, I realized that people generally copy and paste the itineraries without knowing much about the place. There are a few variations which can make your trip a lot more pleasant. Therefore, I will show the standard itinerary and the variations you can include. *One annoying thing in Nepal is different areas can have the same name. Also, some places have different pronunciation or different names but they mean the same place. This is because of the different languages, dialects and pronunciation over there. It can be quite frustrating though when trying to first understand about it. Also, there is little consistency in terms of the elevation profile, even on the official map. Therefore, take the elevation as a rough gauge. I have noticed that there is usually a +-50m difference from my GPS watch. Here is the standard itinerary you will find online in most places. For me, I have always been more of a high mountains person. I hate the humidity of the forests and lower altitudes, ironic as I come from Singapore. The thing about the Manaslu Circuit is that you start at very low altitude (around 700m) and you slowly make your way up through the forest along the river. You can click here to read up more on my detailed itinerary. The river follows you for the first 3 days until you past Jagat or near Deng. For me, it would be best if you can make your way past Deng as soon as possible. The most beautiful parts of the trek starts from Lho onwards. In fact, the areas from Lho – Samdo were my favorite. I noticed that in Sept-Oct, the clouds came in at around 11am+, which obscures any view as well as brings potential rain. Additionally, I realized on hindsight I did not really like hiking after lunch. My advice is to start really early, enjoy the cloudless view in the morning, walk for a solid 4-5 hours and relax for lunch onwards. Therefore, the itinerary is based on hiking through the morning, eating a good lunch and relaxing in the afternoon. Trust me, that makes the whole trekking experience a lot more enjoyable. You also have more time to wander around villages, write your diary, chit-chat with locals as well as do smaller day trips. These are the add-ons you can do for the treks. The information and pictures are sourced online and not taken by me because I did not do any sadly except for Larkye Peak (crazy decision). Tsum Valley was apparently one of world’s remotest Himalayan Valley, and a restricted region until recently (2008). 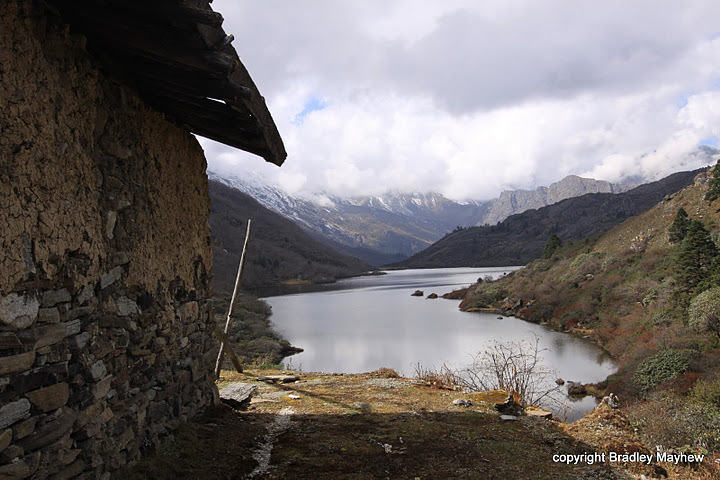 I heard that it is a very beautiful and secluded area, with its own ancient Tibetan dialect and culture. The starting point is Lokpa. You will diverge enroute to Deng from Jagat, somewhere between Philim and Ghap. The Tsum Valley trek requires 7 -10 days on average. A Tsum Valley permit (US$35 for 7 days) is needed if you decide to do it. If I did not do Larkye Peak, I would have considered doing Tsum Valley. Also, you can go to Ganesh Himal Base Camp while doing the Tsum Valley Trek. Here is a standard itinerary. For more information, ManasluCircuittrek has a detailed breakdown on each day. I have read at some places that they recommend a day trip from Prok to this mountain lake (3685m). It looks pretty normal to me from the pictures. I did not do this trek, but I would say skip this and do the other side trips, unless you have a lot of time and you happen to be staying at Prok for more than 1 day (which is unlikely). Hinang Gompa is a large monastery that lies around an hour from Lihi in the village of Hinang. It is supposedly one of the more beautiful gompas in the Manaslu Circuit, surrounded with pine forest and the backdrop of Mount Himalchuli. To get there, one just needs to walk from Lihi towards Hinang Glacier/Himalchuli Base Camp. Lihi itself lies in slightly past Namrung, on the way to Lho. From what I read, the main idol in the gumba is of ‘Gautam Buddha;’ on the right side is Guru Rinpoche (Padmasambhava), and on the left is Guru Karmapa. The Hinang Gompa also serves as a school for the villagers. An interesting thing is that it is part of the Manaslu Trail Race. This side trip is good for people who are interested in culture and Gompas. It is also good if you are a fast trekker because it is just 1 hour from Lihi which means an additional 2h for your route from Namrung – Lho. It is a fantastic side trip if you are headed to Himal Glacier or Himalchuli Base Camp. There would be no reason to do Himalchuli Base Camp as part of Manaslu Circuit unless you are extremely fit, you have really too many days, or you are climbing Himal Chuli itself. If you stay a night in Shyala or Lho like in my proposed itinerary, you can consider going to Punggen Gompa enroute to Sama! Although some might suggest to go from Sama, but you have other side trips to do from Sama. To get there, there is a branch of the road en route to Sama from Shyala and it takes around 2.5h to get there. It has one of the best views of Mount Manaslu, provided that the weather is clear. So start early in the morning if you intend to do this as a side trip! For more pictures and information, you can view Guy Shachar’s photos or this video by Peter Kent. If you missed Kal Tal, fret not. Just head to the more popular and famous side trip in the Manaslu Circuit, the Birendra Lake. It is is a glacier lake formed from the melting ice of Mount Manaslu. Moreover, it can be easily done as it takes around 45 minutes to walk from Sama village. Most people combine it as part of the trek to Samdo, or combine it with Manaslu Base Camp. To get there, follow the direction pointed by the signboard just opposite to Mount Manaslu hotel. Walk straight past the Gompa and you will come to an open field. Walk on until you find the road across which leads you to the lake. Manaslu Base Camp is one of the longer side trips to do in the Manaslu Circuit Trek. As its name indicates, it is the first of the many camps if you wish to attempt Manaslu. Similar to Everest Base Camp, you just trek there to have a taste of it. On the map, it states 4400m but I believe it is an error. It takes around 4-6 hours to get to Manaslu Base Camp and half the time to get back to Sama as it is a straight forward steep ascent. Prepare to start early and bring enough water as there are not huts along the way. There might be many helicopters flying around if you are hiking during the trekking season, as the helicopters might be picking up the mountaineers who had successfully conquered Mount Manaslu (8163m) or saving people who are injured. This trek gives you marvellous views of many mountains around the region. Also, it can be done within 6-8 hours, which makes it great for both acclimatization and a day trip. I would highly recommend this as part of your extra day in Samdo. The other way as recommended by Guy Shachar is to “go north from Samdo as if you are going to Dharamshala: crossing the Athahra Saya Khola and climbing from the other side. But instead of going west towards Dharamshala, you continue north along the western side of the Athahra Saya Khola. The trail climbs gradually along the Athahra Saya Khola and then descends gently towards the river bed crossing a side river on a wooden bridge. It then climbs again and goes beside the river on its western side. After 3 hours walk from Samdo the Athahra Saya Khola turns west. For more information and pictures, you can view Guy Shachar’s post here. Base Village : None! Set up your own base camp at Larkye Pass. As we wanted to do a high altitude peak in our trip, we included Larya Peak as part of our Manaslu Circuit Trek. It did not go that well and you can read up more about it here (when I write about it after getting over my trauma). It was a good idea then because it was higher than Stok Kangri, bit more technical, and much lesser known than other mountains, an ideal advancement and choice for us. Having said that, one can do it easily as you set up the base camp in Larkya Pass (the name must come from somewhere right?). There are 2 peaks to climb there, Sano and Thulo. I used this information but it was old information. Do note that the mountain conditions have changed in Larkya Peaks. There are also various heights for the mountain so nobody really knows what the height is. Some say it is 6246 while taan lists it as 6416. To attempt Larkya Peak, you will need to get a climbing permit, tents, proper equipment. So get an agency to organize it! Do not do it alone as it can be quite dangerous! For more information on side trips, these websites provide quite good information. I bought the map of Manaslu in Nepal to utilize while trekking. The amazing thing is that the people who created the map ( Himalayan Map House ) actually made a high definition version of it online! This is just the route profile for your reference, taken from the map. The following estimates are excluding side trips. There are some people who simply skip the first part of the trek by taking a helicopter to Philim or Namrung ( I might be wrong about the villages). This will shorten the days required for the trek if you are short on time, or allow you more time in the higher altitudes where the scenery is in my opinion, more beautiful. It is also possible to start from Dharapani, the reverse direction. However, the ascent is really fast and it is good for those who are confident about dealing with altitude. There is water available most of the trek. We simply refilled our water from the flowing river streams or numerous waterfalls. In the villages, there are a few public taps where the mountain or spring water flows. Nothing happened to me, but to be safe you can boil or use those purification tablets. The only place I was slightly sceptical about the water was in Dharmshala, so just be careful when drinking the water there. For showering, if you don’t mind cold water there are plenty of chances to shower. For hot water, there are very few lodges with such facilities. Even if they have, they would either charge for it, or it would run out after a while so don’t bank on it. If you are really desperate, you could pay them to boil the water for hot shower but you would have to wait. Honestly, if you are thinking about showering when you are in the mountain, you are highly likely a person who haven’t hiked multiple days before, haven’t experienced high mountains or a really clean person. Showering will be an afterthought there in the cold. Animals might be cute, but they are often more dangerous than you think. Always beware of the donkeys or other animals which use the same path or are coming from the other direction. The route is less well-maintained and narrower than other treks. Some of them might come charging down the path and ignore your well-being totally. You are expected to get out of the way. Therefore, always avoid the animals and give them space to cross first. If you are crossing the animals, try to always cross from the front because you do not want a casual donkey kick to kick you off the road and into the river or off the mountain. The route can be quite slippery at times, especially when it rains and at the lower levels near the river. Be careful of fallen logs and rocks. In the picture below, was a donkey who slipped off the side and was injured and baying loudly. All of us ( porters + various hikers) chipped in our strength and used the ropes to carry him out. After it finally stood on its legs, it walked on as if nothing happened. 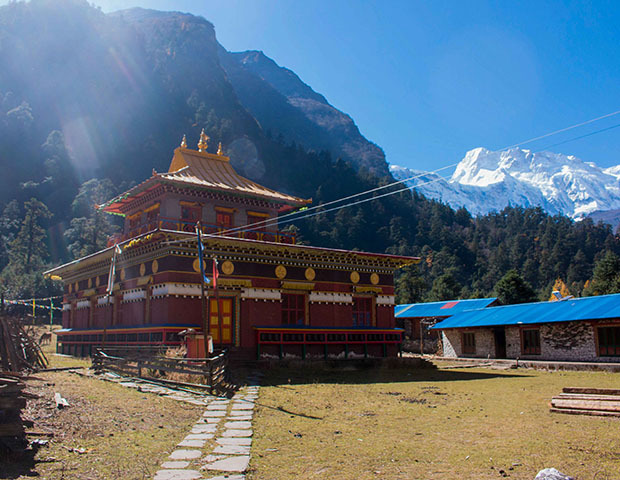 There are various religious structures in Manaslu, such as Stupas, Chortens or Maani Walls. A Maani wall is made up of stone tablets engraved with mantras. It is usually noticeable before you reach the stupa because the pathway will suddenly fork out into two paths. The general rule of thumb is to always take the left road (clockwise) even though you are not circling back unless you wish to. This is to show respect to the sacredness of the structure. Similarly, when you see the spinning prayer wheels, always move and spin in a clockwise direction. The general rule is also to leave your shoes outside the temple unless otherwise stated (which never happens). *These are seen more in the higher altitudes, from Namrung onwards because in the lowlands, they are dominated mainly by the Hindu culture. One of the joys of doing trekking is meeting the local people, especially kids with their unbridled enthusiasm and joy. They would often want to shake your hand, so don’t be afraid and go and shake hands! However, there are often many cases of them running up to you asking for money, chocolates, pens or whatever weird things they can think of. Some of them even shout out “chocolate!” when you walk past. My personal belief is not to give because it encourages begging and bad habits. More importantly, please do not provide chocolates or sweets as it is bad for these village children, pens and more practical objects are better if you had to give. Therefore, I would encourage people to interact and support the local community but not give free stuff to the children. This is a debatable and sensitive topic for all photographers. How and when should you take a photo? My policy is to almost always ask first unless you are extremely far away. In a house or a temple, please always ask before taking a picture if not it is very disrespectful. The locals do not speak much English, especially at higher altitudes or more remote villages. Rely on your smile, your gestures and common sense! There is no ATM anywhere on the Manaslu Circuit Trek (Duh, what were you thinking?!). Also, USD or Euros or any foreign currency is highly likely to be useless unless you are at Dharapani or Soti Khola. They usually only accept Nepalese Rupees. As the rates are pretty much fixed in Kathmandu, change sufficient cash and bring it up with you in the mountains! Bring insect repellent! This is something most people forget because usually in the high mountains you don’t need it, but you require it for the first few days of the Manaslu Circuit. Other than that, the standard trekking gear is sufficient. It starts to get chilly once you are past Jagat and can be really cold once you are in Samdo. I’ve noticed that although the temperature wasn’t so low, it felt a lot colder than it was due to the moisture in the air and wind chill. Be prepared for rain throughout the trek as the weather can change quite easily, especially at the lower altitudes. After Dharmshala, be prepared for snow because Larkya Pass is notorious for bad and fickle weather. Sunglasses are extremely important while trekking from Dharmshala onwards because it can get extremely bright and unshaded. It would be good to bring along a good sleeping bag just in case as the lodges sometimes do not provide blankets, or they don’t have sufficient ones. You might need to request for blankets or might need to pay for them. It happened to us quite often when we enter our room and there are no blankets. I believe you can get an agency to settle everything for the Manaslu Circuit for around 1,000 USD for a 17 day itinerary (including transport, food, accommodation, guide, permits, porters etc). This is excluding tips. If you bargain well, you could get it for around 700-900 USD but most likely with a shorter itinerary. To do it the cheapest, get 1 porter to act as the guide and do the permits yourself. Make sure to have your own sleeping bag, get local prices and not buy snacks or unnecessary drinks and food. I know some people who have done it within 700 USD. To help you, here is an estimated breakdown of the relevant costs. The transport (2 way) from Arughat should cost around 200 USD (in total not per pax) at most. To Soti Khola, it could cost around 200 – 250 USD. If you wish to share a transport, the manaslucircuittrek website is a good platform to find other hikers to share the transport with you. The cheapest food is the local food, either Dal Bhat or potatoes. Prices are fixed. Please do not try to bargain unnecessarily unless you want to be in a video. Although you can’t bargain, you can try to negotiate because there is a local price for some items. On the menu, it might seem that the Dal Bhat is really expensive, but we were shocked to see everyone eating Dal Bhat. After asking around, we found out Dal Bhat was the cheapest and there was a local price (it was around 20% of the stated price). Try to get your guide to negotiate for the local price. This applies to beer too. In general, the menu has noodle and rice varieties. The meals are usually 300 rupees and above, which is around 3 USD. If getting something special like a Burger, estimate 5 USD. Meat can be usually found at the lower levels, especially dried meat. Meat is also dependent on the village you are in, if they kill the meat for you. If you are really hungry and in a group, you can consider paying the villages to kill a chicken or a goat for you. I generally sustain around honey, eggs and rice/noodles. Basic tea is around 60 rupees, which is 0.5 USD. For something like hot chocolate or honey lemon tea (awesome stuff), prepare 150 rupees or more (1.5 USD ++). Hot water cost money too! (Around 60 rupees). If you wish to save money, you could try getting a local to get the hot water for you. Beer is slightly more expensive but still way cheaper than Singapore prices. They range from 3-5 USD. Remember, you can always bargain for the beer! Therefore, a good budget for food per meal is 5-6 USD, which comes up to 15 USD a day at least unless you skip meals. Budget more for your tea stops! Keep in mind that the higher you go, the more expensive things become. Food and drinks in Dharmshala and Samdo were like 2X the prices in Jagat. *In terms of sustainability, try to eat whatever the locals eat. Please refrain from buying snacks and bottled water. You can easily boil the water there. Do know that a lot of the noodles, rice or burgers are packaged food and carried up the mountain, especially the higher up you go. Trash is usually carried down (back-breaking) or burnt (high chance) or just thrown to one side (100% chance). The picture below shows cows eating rubbish in Shyala. Surprisingly, there is wifi in most places with the exception of Dharmshala. The connection might be iffy at times, especially when there are many users. They usually charge for wifi or charging and it depends on which village you are at. Very few places offer free electricity. There are usually charging points, where they charge money too (get it?). Charging cost can be quite messy because they do not really record down who is charging what. They do not charge by use, but by the number of gadgets. Make sure to clarify on the charging cost and identify each specifically, if not every gadget from the guides, porters and other groups might be charged to you! The lodges or guesthouses are usually comfortable enough (with the exception of Dharmshala). They have nice big beds and rooms, with decent toilets. Some places might have hot showers but don’t bet on it and they are usually chargeable. The accommodation isn’t as expensive as I expected it to be. In fact, accommodation costs were quite constant throughout the trek. They range from 300 rupees (3 USD) to 600 rupees (6 USD) for 1 room. From my understanding, they average around 3 USD per night per person. Tips : 5 USD a day is a good gauge. As mentioned before, the guide can act as a porter to save cost and vice verse. These costs are just estimates. Usually the guides and porters share 1 room to save cost. This should form the basic starter pack for what you need to know about the Manaslu Circuit Trek to get you prepared for it. To know more about the trek itself, please read my detailed post on the whole route and the villages. I did my trip in September-October 2017. Some other websites to visit to read up more on Manaslu in case you are not satisfied or wish to cross-reference. Honestly, most of the information is copied and pasted across the websites as they are written by the same few people. Manaslu round trekking is also worth to add Tsum valley. it is about a month trip plan including days in Kathmandu. Yes my post does have information on adding Tsum Valley which I believe would be good. I think 21 days is enough for Tsum Valley, you don’t really need a month. Hi there, First of all thanks for your blog as it is an amazing pool of info. The cost of the fees are stated in the blog post, under permit and trekking fees. Usually, if you go through an agent, they charge 1 lump sum for 10 days, it should include settling the permits. Just make sure to clarify with them so there is no extra charge, but you will need to get all the permits done before you trek anyway! If you get a guide directly, then you most likely would need to ask the guide to help you with the permits. Thanks Ganworm for your quick reply. I have a last question which is slightly confusing for me as there is conflicting information on the net. How much does a private jeep cost from Kathmandu to Sotikhola per way ? I got a quotation for 160 USD per way ? But you mentioned 200 to 250 USD Both ways. Can you please help on that. It is as what I mentioned =) You could get many different quotations, there is no fixed price there. The price I have stated is of course a low budget price based on my research. You would most likely have to try many different agencies or really negotiate. I believe 160 USD 1 way should be the initial quote they give. Of course, if you do the trek with the agency, there is a high chance the transport cost will be lower. At the end of it, it is a rough gauge. You should pay for what is affordable or what you feel is right. It is their livelihood afterall. If you take a guide, that included service charge of the company to make permit and other arrangement. Thank you for your reply. Would you care to share which agency did you go to for your guide and transportation ? Hey Lorenz, I did it through a friend. Their agency is called : UNO Travel and Adventure Pvt. Ltd. The prices you get might not be what I mentioned on the website though. Hello, Thank you for great info. I tried to find your link, ( “You can click here to read up more on my detailed itinerary.”) but I think the link is not there. Would you mind to post it? You mentioned you climbed Larke Peak, is it a trekking peach for which you just need trekking shoes or is it a climbing peak with crampons, ice axes, rope etc? Hmmm actually you cross a moraine and the summit push definitely needs crampons and ice axe to be safe. Yes you will most likely need ropes also, because the weather changes it quite a bit. Your guide/travel agency should be quite experienced for this. Really great information regarding the Manaslu circuit trek. Hi! Great overview! Answered so many of my questions. If you do send your porter/guide ahead is the route easy to follow or are you likely to get lost? Is the trail well marked? Would a GPS watch and map be mandatory? And about the showers…understand about charging for hot water and not wanting to shower when it’s that cold anyway. But is it technically possible and “easy” to have a shower if you wanted? I’m not a princess and can last a couple of days without one but I have sensitive skin and would need to rinse every few days. No problem. You don’t really send the guide/porter, usually they will automatically go, especially if you have a group, just discuss with the guide. However, if you are 1 pax then that is harder. You either need a guide who is familiar so he pre-calls, or trek fast. As for hot water, yeah you can always ask them to manually boil the water if you need hot water!